The Arqspin 12" Motorized Photography Turntable with Software and Lifetime Basic Service Plan is a complete 360° product photography system. 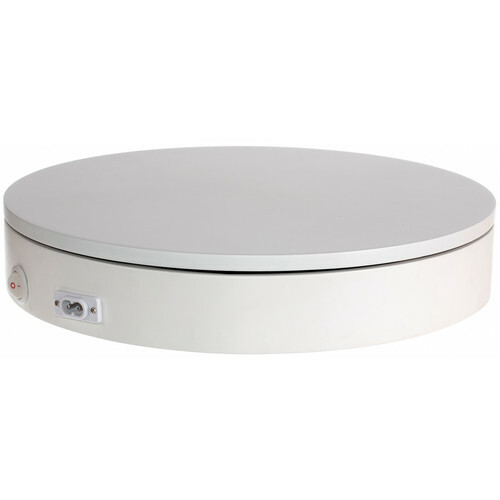 It includes a 12" turntable and a lifetime license for Arqspin's web-based software and service solution for adding interactive 360° product views to your website. The lifetime Basic Service Plan lets you store an unlimited number of "spins" on Arqspin's servers and allows for 10,000 spin views per month. The 12" motorized turntable supports up to 150 lb and makes one full rotation one to two times per minute. Once your subject is ready, all you need to do is capture video using a camera you already own, upload it to the Arqspin servers using the web uploader, and then get back a "spin" to embed in your website. You can even do it all from your smartphone using the free app for iOS and Android. Once uploaded, your videos are converted into interactive spins ready for embedding. The embedded viewer works on any web-browser enabled device, as well as iOS and Android mobile devices. For applications that require the use of Flash technology for external embeds, a Flash viewer can be used instead of the default HTML embed code. A browser-based video editor lets you make adjustments such as crop and color balance without the need of additional software. Because spins are stored on Arqspin's servers, you can access and manage them at anytime and from anywhere, as well as view analytic data to see how many views your spins are getting. Capture 360° product views using the video camera you already own, including a DSLR or smartphone. Simply record a movie of your object making a little more than one full 360° turn (1.5 rotations is ideal) and import the movie into your account using the web importer. Process multiple files at once and quickly convert your videos into interactive spins on Arqspin's servers. Free Arqspin app for iOS and Android devices lets you access the full suite of capture, editing, and publishing tools. Get up and running with 360° photography all from your mobile device. All of your spins are stored and managed online and stored on Arqspin's servers. This means that they are accessible anytime, anywhere and on any device. You even get access to spin analytics to see how many views your spins are generating. Use the Arqspin web editor right in your web browser to make common edits like adjusting the crop window, color balance, and adding useful product information like a SKU number. Adding a spin to your website just involves pasting a single piece of HTML code. The spin viewer includes a number of adjustable parameters, letting you control things such as the size of the window and whether or not it automatically begins rotating after loading. Certain websites, such as ebay, use Flash technology for any external embeds. For such applications, Arqspin provides a Flash viewer that can be used instead of the default HTML embed code. What happens after you reach 10,000 spins per month? Does it just stop? Is there a surcharge? After 10,000 spins it stops working until the following month.You can get custom subscriptions if you do need more than 10,000 spins a month. You will need to contact the manufacture direct, http://bit.ly/1OD0Qsk.